Editor's note on Dec 8 2015: Perry Nodelman's comment and Philip Nel's response are now in the body of the original post. I read your post about your new book, Was the Cat in the Hat Black: The Hidden Racism of Children's Literature, and Why We Need Diverse Books. On one hand, I want to say congratulations, because I know that people buy/read/teach your books, and as such, books that look at racism in children's literature are important. On the other hand, as an activist scholar from a marginalized population, my thoughts and emotions since reading your post include me uttering "WTF." As I write that last sentence, I imagine a lot of my colleagues in children's literature rolling their eyes--not at you--but at me. The truth is, though, that my WTF won't hurt your career. You're a white male, tenured, at a Research I school. You have all the cred in the world. You also have many books published--books that have been very well received. I have some questions. I could raise them in an email and thereby have a private conversation with you, but, those private conversations tend to be helpful to those who already have power, so I've chosen to do this publicly. "The book is about different manifestations of structural racism in the world of children's books: the subtle persistence of racial caricature, how anti-racist revisionism sustains racist ideas, invisibility as a form of racism, whitewashing young adult book covers, and institutional discrimination within the publishing industry." Let's start with structural racism. You know We Need Diverse Books is trademarked, right? And you know that the organization itself is a grass roots effort comprised largely of people of color who object to the ways that structural racism consistently rewards white, and specifically white males, for the work they do--over the work of people of marginalized communities, right? Are you in conversation with anyone at WNDB about your book, and/or have you had conversations with anyone there about using that phrase in the title of your book? I hope so, because if not, you might be rendering them invisible and thereby contributing to "invisibility as a form of racism." "a hearty thanks to those who have read and commented here, answered my questions, offered feedback when I've presented portions of this work, or educated me via your books and articles. I've learned so much from all of you. (Hint: Look for your names in the book's Acknowledgements!) I couldn't have done it without you. Thank you." Given your status, it seems to me that you could have done more than list people in the Acknowledgements. This is a huge presumption on my part, but my guess is that I am one of the people who may get listed in your Acknowledgments. Maybe I am, and maybe I'm not, but either way, your hearty thank you--though you mean well--will not be received in the way you might think it would be. There is a robust conversation online about people in privileged spaces being informed by the work of people of color--and using that work with little to no acknowledgement. Being listed in an Acknowledgement is not what people want to see. Do you quote from Twitter, Tumbr, and various blogs, and do you cite the individuals? I hope so! In a way, this ask is similar to my asking about your use of the We Need Diverse Books phrase. By that, I mean that it is hard to say when a bit of information or knowledge ought to be attributed to a specific person. With social media, the voices we read are much more diverse than they've ever been before. It can mean that ideas and points of view seep into our own heads and shape our thinking and then become our thinking, and then it seems unnecessary to cite a specific person who was instrumental in ones own thinking! But it IS necessary. The community of people participating in conversations about children's books is larger than it has ever been before--thanks to social media--but scholars should not replicate injustices of the past wherein white males profit through the work of those who they and their ancestors, overtly and subtly, oppressed and oppress. Actually--I think people could fairly wonder about the project itself. It could have been an edited volume, with you using your stature as a means to lift the names and work being done by people who aren't white males. Course, in wondering that, I make some assumptions that you and I see things from a similar vantage point! Our conversations on your blog suggest that isn't necessarily the case. But you also said in your blog post, that some of those posts (where we conversed via the comments) contain "admittedly flawed" thinking, so maybe you're in a different space today than you were then and could, therefore, lift those voices. "attempting to do for children's books what The New Jim Crow does for the justice system." We do need to get more people to think about racism in children's literature, and there's a lot of people who have been doing that for a very long time. You say that it is a "tall order" to do for children's literature what Michelle Alexander's book does for the justice system. You're inadvertently placing yourself on the same plane as a Black scholar like Michelle Alexander? I'm stuck right there. Stuck without words to capture what that feels like to me. A huge problem in children's literature is white saviors sweeping in to help or rescue characters of marginalized populations. And here you are, doing that very thing. Did you realize what that would feel like to people of color? Did you imagine any of us, reading those words, as you wrote them? Did you imagine us as your audience? You say that you'll also look at institutional discrimination within the publishing industry. Seems to me that gives you space to write about institutional discrimination within the academy, too. I'm guessing you've read the various articles online about the experiences of people of color in the academy. We both know how white our field of study is, so it seems that your book might address barriers we face, as scholars. Does it? My sense from that line in your post about flawed thinking in earlier posts suggests to me that you're in a more reflective space than you've been in the past, but the things you said also suggest that the flawed thinking is still there. We care so very much about children's books, and the work we do. In that care, we are often blind to what we say and how we say it. Maybe it is the flow of a new project that inadvertently blinded you to the way your words in that post read? Indeed, there are likely things I've said in this letter that are similarly blind and I hope that people will note them in comments. All that said, I look forward to your book but hope that it is a bit more... reflective of your own privilege than your blog post about the book is. You raise important concerns here, Debby--ones that are constantly on my mind these days as I continue to think about and write about children's literature. I recently became painfully aware of my own unconscious expression of white privilege as I looked through old articles I was considering uploading to Academia.edu, and came upon one on Scott O'Dell's Sing Down the Moon which was published in Horn Book in 1984. It's full of praise for a novel about the “Long Walk” of 1863, in which American soldiers forced the entire Navajo nation to relocate after destroying their villages and crops. Among other things, I say in this essay that I admire O'Dell's choice of not providing his young Navaho narrator with a name for much of the book--a choice which I saw in 1984 as universalizing her and making her a sympathetic and believable character, and which I now see as a commentary on the deprivation of her personhood that in fact confirms and reinforces that deprivation. I also celebrate O'Dell's depiction of the Navajo stoicism and refusal to express anger at what is happening to them--another confirmation of a hoary stereotype. Worst of all, it become apparent to me as I read through this old essay that I simply took it as an absolute truth that no one who was Navajo or even remotely like a Navajo would ever be part of the audience of the book: "Sing Down the Moon is about people unlike ourselves," I conclude, clearly and unconsciously assuming that all the readers of this book would all be white like me. I am wrestling now with whether or not I should upload this essay as evidence of how ignorant I was and much I've learned about these matters in the last three decades--much of it from you, Debby. Uploading it would have to potential to be very embarrassing; not doing so would misrepresent who I once was. I’m tending to choose to upload it. At any rate, I find these issues of unconscious racism--my own and that of other white people, especially other white men--deeply troubling. I don't want to have to remain silent about the racism that I find so troublesome, but I'm also aware of the troubling aspects of my choosing to speak about what so troubles me. My own solution to this dilemma is to forefront in anything I write about these topics my awareness of the potentially poisonous aspects of my speaking about them—to acknowledge my white male privilege and to attempt to become aware of how it might be distorting how I see things and read texts before and during and after my readings of those texts. I want to acknowledge and accept the possibility that I might yet once more be seriously embarrassing myself, in the faith that even if I do, my doing so will help to further a cause I profoundly believe in by confirming the blindness of my privilege. And I would hope that any discussion of these matters by other white men like me would be equally aware of and forthright about the minefield they enter in writing about race, equally open to exploring the possibility of their blindnesses, and equally unwilling to assume a kind of authority that unconsciously replicates the very kinds of unconscious repression they want to argue against. Thanks for your critique of my unpublished manuscript. Here are some responses to your queries. As is the case in all of my scholarship, this book builds on a lot of research, all of which I cite. I’ve learned from books, scholarly articles, blog posts, tweets, journalism, conference papers, and more. There are children's literature scholars, critical race theorists, children's & YA literature authors, theorists of affect, among many others. Then, in the Acknowledgments, I name people who have been especially helpful. But I haven't finished compiling the Acknowledgments yet, and I didn't want to publish an incomplete Acknowledgments on the blog — so, that's why I left that part of the blog post deliberately vague. Michelle Alexander's work is amazing. The New Jim Crow should be required reading for every citizen. Even approaching her level of brilliance would be a tall order. So, if the blog post implied that I'm in her league as a writer or scholar, that's not my intent. I aspire to her level of work, which — to be frank — is how I approach all book projects. I want to write something better than I'm capable of, and so I look to other, better scholars as my role models. There are several such models for Was the Cat in the Hat Black? Alexander's The New Jim Crow is one. Robin Bernstein's Racial Innocence is another. In conclusion, I think that the book will address your concerns. I’d be glad to send you a copy when it comes out. Back in November, The Guardian awarded David Almond its children's fiction prize for his novel, A Song for Ella Grey, which is a retelling of the Orpheus and Eurydice myth. Subsequent to the letter Banks wrote to The Guardian, BBC's Radio 4 invited Almond and Banks to be on its Today program. I listened to, and transcribed the program, for those of you who might want to know what was said but are not able to listen to the archived segment. But some people not yet 12 experience lesbian desire, and/or swear or drink; and others live with older people who drink, swear, and feel no need to hide their lesbianism. I assume, then, that what Banks really objects to is fiction for young people that diverges from a supposed norm of ideally innocent (and heteronormative) childlikeness. Such fiction rarely represents anything like what most young people experience, and exists mainly to assure adults that childhood is actually more innocent and ideal than it usually is. Those who chose Almond’s more honest novel as a prizewinner should be lauded for not sharing in this sad game. Perhaps novels about younger young people might win more prizes if writers could figure out how to make them less dishonest about the lives of “people up to the age of 12”. Early in graduate school, I read Perry's books and articles on children's literature. His thinking has been important in my thinking, precisely because of what he said in his letter above about honesty and the lives of children. Well, Lynne Reid Banks is with us, and David Almond joins us from our Newcastle studio. I suppose, David, to defend yourself, we’ll talk to you in a minute. Lynne Reid Banks, were you surprised? Were you shocked? And if so, why? Banks: A great admirer. He wrote Skellig. He’s done some wonderful books. What I’m quarreling with is The Guardian, for giving this prize under the name of a children’s book award. If only there were a separate award for teen aged, young adult writing, then he should have won it, I’m quite sure. I haven’t read the book yet because I am so disappointed that its obviously not suitable for what I call and categorize as children, which are people up to the age of 12. Moderator: I suppose we’re getting into a categorization argument, aren’t we, David Almond, but just explain who you were thinking of when you wrote the book, what kind of age? I know you don’t target it in that way but what kind of age do you think the readers would be? Almond: When you write you really don’t think about the target age. You think about the characters you’re writing. You think about the drama that’s involved in the story. The drama is described, narrated, by a teenager of about 17. So I had a sense that yes, maybe the main readership would be of that kind of age. Moderator: What they call young adults in bookshops? Almond: Yes, young adults. But this book is being read by 12-year olds, 13-year olds, and I’m getting fantastic responses from them. They recognize something about the beautiful troubling drama of growing up. Moderator: Give us a little extract. Could you? Just to give us a feel and then we’ll talk to Lynne Reid Banks again about her feelings. Just tell us where we are in the story and just give us a few lines. Almond: This is right at the start, where Lynne wrote about and Claire and Ella are on a sleepover together and Claire is telling the story. “We were in bed, the two of us together. Ella turned to me, and she was smiling. “Claire! I’m in love with Orpheus." "But he hardly even knows you bliddy exist!" She pressed her finger to my lips. "I keep on hearing his song! Its like I’ve known him forever! Oh, Ella, it's destined! I love him and he'll love me. And if you hadn’t called me that day and told me to listen," she kissed me, "none of this would have happened, would it?" I pulled me clothes on. She kissed me again. Thud went my heart. Thud. Moderator: Well, that’s pretty powerful writing, Lynne, isn’t it? Moderator: Let’s not have an argument about The Guardian. Its quite interesting… What are the problems. If you go into a bookshop these days and people often comment on this, is that books are categorized by age. Banks: No, they’re not. Are they? Moderator: Children’s don’t think like that, do they? Banks: No but I think if you would append the word children to a prize as is also with the Carnegie Medal which is the highest award we give here for children’s writing, and if year after year you give it to dark, dystopian, violent, in some cases, downright cruel books, I don’t know quite where people who are writing for children, which of course David Almond has also done, where do we come in? We don’t seem to have a prize of our own anymore. Almond: Absolutely. But the Orpheus story itself is such a powerful, elemental tale. When I was a teacher I used to tell the Orpheus story to 9-10-11 year olds. They were totally gripped by it and this is just a new version of that story. And the thing about children’s books is if you go into the children’s book department you will find all kinds of wonderful, experimental, creative, energetic books. That’s where people should be looking, and not thinking about where should we categorize this book or that book. This is an amazing world. People really believe that books can change peoples lives. Moderator: A lovely moment of agreement. Lynne Reid Banks. David Almond in Newcastle, thank you both very much indeed. My grandfather, Rex Sotero Calvert, was Hopi. We never called him grandpa or grandfather. We called him Thehtay, which is the Tewa word for grandfather (Tewa is our language at Nambe Pueblo). Calvert is the name he was given when he went to boarding school, at Santa Fe Indian School. Before that, he was Rex Sotero Sakiestewa. He was born in 1895 at Mishongnovi Village. At SFIS, he met my grandmother, Emilia Martinez. She was from Ohkay Owingeh (San Juan Pueblo). They lived at Ohkay Owingeh and had six children: Delfino, Felix, Marcelino, Edward, Andrea, and Cecilia. To me, they were Uncle Del, Uncle Felix, Uncle Mars, and Aunt Cecilia. Edward--we call him Uncle John. He still lives there, at Ohkay Owingeh. Andrea--we call her mom. When I talk with my mom, we sometimes talk about Thehtay. He lived with us at Nambe Pueblo when I was growing up. I remember him being out back, working the garden with a hoe... Suddenly he'd yell "The beans!" We'd have been playing in the garden as he worked, no doubt un-doing the work he'd been doing to irrigate that garden as we made little dams to divert the irrigation water! Remembering the beans, he'd throw down the hoe and run inside the house to add water to the pot of beans on the stove. When he was older, he'd sit in his wheelchair, softly singing Hopi songs to himself. I wish I'd listened to them, and that I'd learned some of them. What I do have are warm memories of him, of being with him, of his humor. This morning as I read My Hopi Corn and My Hopi Toys, my thoughts, understandably, turned to Thehtay. Written by Anita Poleahla and illustrated by Emmett Navakuku, the two are board books from Salina Press. I don't have a memory of Thehtay planting seeds. My memory is of him in a button down shirt and jeans (nothing on his head; not wearing a belt or mocs as shown in the illustration) using a hoe to rid the garden of weeds. Corn. Community. Ceremony. Planting. All are important to who the Hopi people are. I really like this little book and wish I could share it with Thehtay. 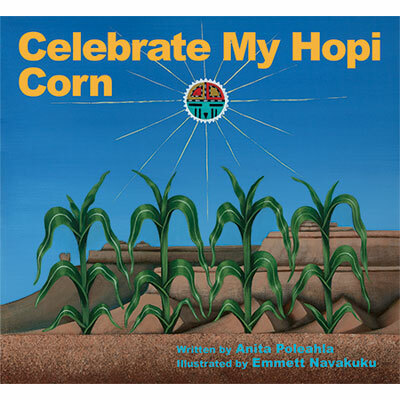 Poleahla and Navakuku's second book, Celebrate My Hopi Toys is a counting book of items used for play, but also for dance. I like it very much, too. 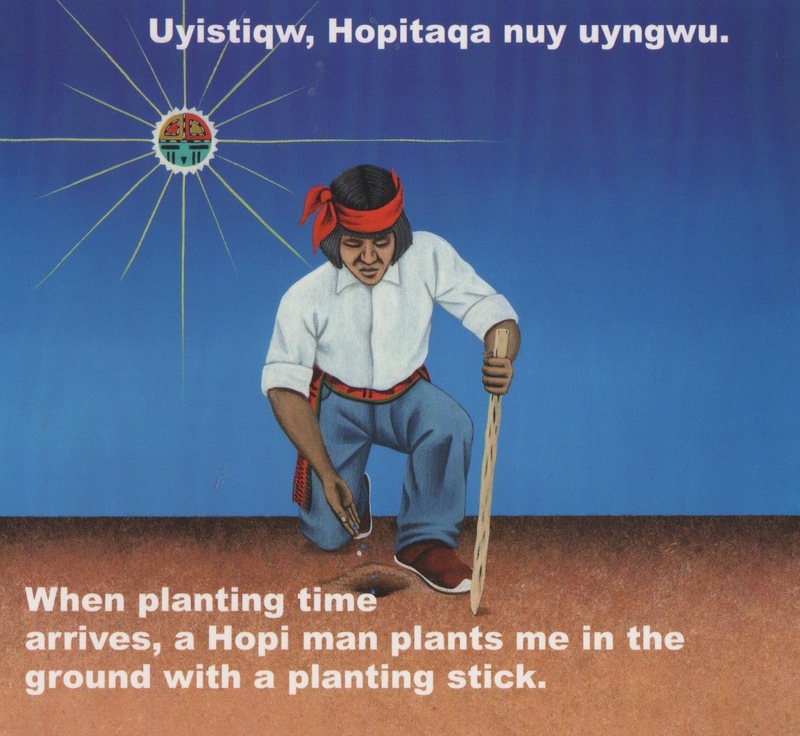 Like Celebrate My Hopi Corn, it is bilingual and shows items specific to Hopi people. Poleahla has been working on language instruction for many years. These little books will, no doubt, be much loved by Hopi children, but they're terrific for any child. For children who aren't Hopi, they provide a window to Hopi culture. A window--I will also note--that is provided by insiders who know just what can be shared with everyone. They are available from Salina Press.